Fort San Pedro is worth looking around, if you have the time. Fort San Pedro is Cebu’s version of Intramuros — only it’s a lot smaller. 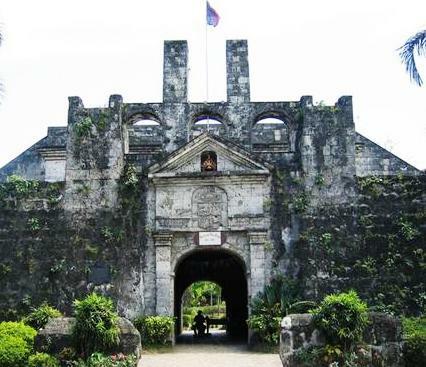 In fact, is the smallest fortress in all the Philippines. Mind you it took more than 2 centuries to complete, but it was effective in getting rid of pirates and other natives who fought against the Spaniards. Fort San Pedro can be accessed by either a jeepney or a taxi. Either way, you’ll have to make a stop at Plaza Independencia, the walk will only take a few minutes to reach the fort. If you’ve come from the airport, it will take you less than an hour to reach. You will spend a much shorter time if you arrive by boat, since the port is located near Fort San Pedro. The best way to admire all the huge stones that make up the fort is to walk around the area, that’s right get those feet moving. There are small pathways that you can follow. There is no tour guide to show you around, you will have to do this on your own. It also has a museum, which holds several important historical items. A lot of them have been excavated near the area. They include utensils, pots and even skeletons of locals in the city. It also contains what has remained of the “San Diego” vessel, which sank in Batangas. The museum is open from 7:00 a.m. until 11:00 a.m. only. Thus, plan your tour well. The garden is open for public use, as long as you pay a fee. You can hold birthdays, weddings, anniversaries and other special occasions. They also have one of the cheapest rates available, much lower than those in hotels. As expected, though, you have to make the necessary reservations to ensure that the place will be booked for your personal use. Fort San Pedro is just within Plaza Independencia. Since it would not take you the entire day to tour the fort, you can spend the rest of your time here. It used to be a place of discussion among the people, especially during elections. Today, it’s a favorite spot of lovers and families who are looking for cheaper alternatives to shopping malls and resorts. The food is very cheap, however, if you have a very weak stomach, then go to AA’s Barbecue, which is located just across the plaza. It’s also highly recommended to stay away from very dark areas of the plaza. Like most places there are thieves around so you should make sure you are not their next potential victim. Besides, the well-lit portions are filled with several activities. There are concerts, debates, and cultural shows.